The monument you see before you is dedicated to the struggle for freedom; the idea was first mooted during the early 1920’s. After several contests the sculptor Karlis Zale’s [here and further Latvian words to be read as written - Za:le – with the accent to the first syllable] project “Flicker like a star!” was selected. Construction work began in 1931, and it was funded through donations. 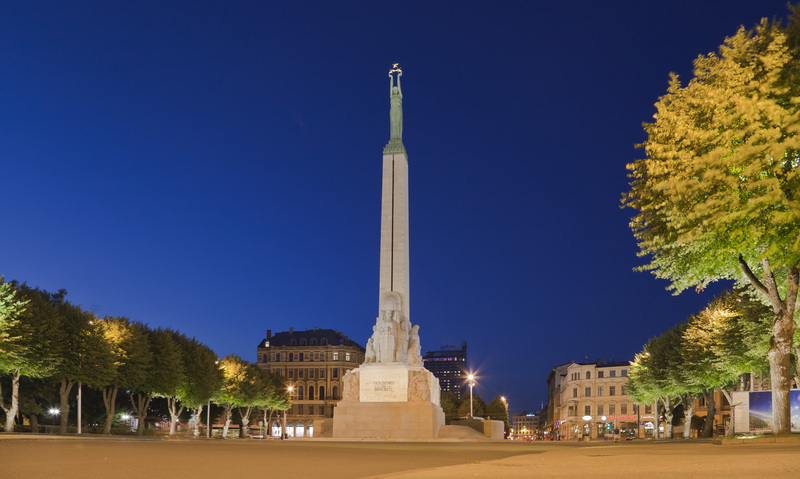 The monument was opened on November 18, 1935, on the 17th anniversary of the Latvian Republic’s founding. The granite used to build the monument came from Finland. The travertine came from Italy, and the image of Liberty was cast in bronze in Sweden. 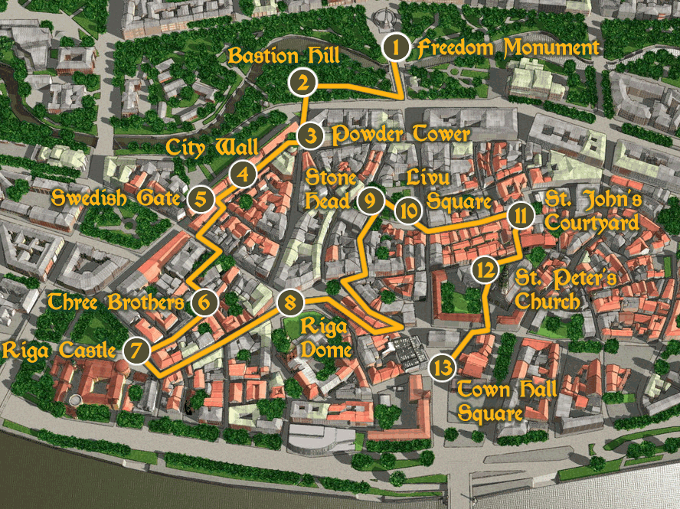 The monument is made up of 13 sculptures and bas-reliefs which depict different aspects of Latvian history and culture. Images can be divided into three levels - the lower, middle and the upper - the image of Liberty. The lower level is devoted to the core values of people and is formed from four groups - “Work”, “Mother - keeper of the family”, “Defenders of the Fatherland” and “Elements of the spiritual life.” In these four core values lies the spiritual power of the Latvian people. The images tell us about the people’s revolution against the Russian king in 1905 and the struggle for the freedom of Latvia. In the central part of the base of the monument, you can see a group named “Mother Latvia” with the words of dedication «To the Fatherland and Freedom”. Its author is poet Karlis Skalbe. During the second half of 1980’s a popular movement called Atmoda, which translates as awakening, started to spread throughout Latvia, and despite the possibility of reprisals, the meetings began to gather near to the monument. People met to remember important folk events. On June 14, 1987, 3 years before Latvia regained its independence from the Soviet Union, the first demonstration against the Soviet power was held near the monument. More than 5 000 people took part in this demonstration. After Latvia’s regained its independence it became possible to restore honor guard at the monument. If you look towards the Old Town, on the left side you will see the “Laima” clock - one of the most popular symbols of Riga. It was built in 1924 to help the people of Riga to get to work on time. In 1936, the clock was painted in the name and logo of Latvia’s largest sweets producer “Laima” (Happiness). After World War II, the clock was used as a stand for political information. In 1999, the clock has been completely renovated, and restored to its 1930’s look. Today the square around the clock is a favourite spot for meeting Rigans. And if you look beyond the “Laima” clock you’ll see the widest pedestrian crossing in Latvia, which leads to the Old Riga, the historic centre of the capital of Latvia.